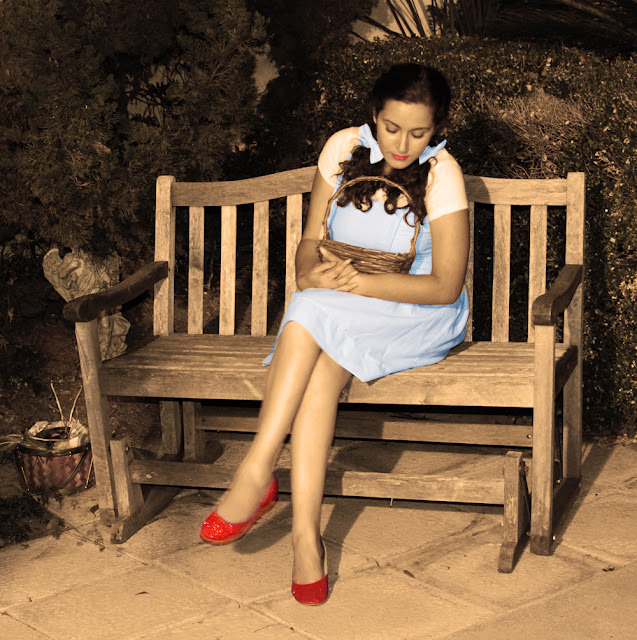 Today we have our lovely friend Sandra modeling a Halloween costume classic: Dorothy Gale! I don't know anyone that doesn't like The Wizard of Oz. It's a classic movie with an iconic outfit (several actually, who wouldn't recognize the tin man or scarecrow?). 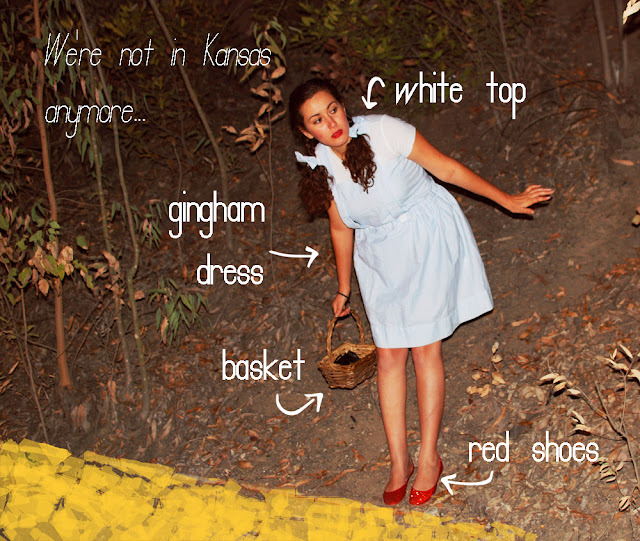 We had fun walking down our imaginary yellow brick road and mastering Judy Garland's doe-eyed, pouty-lipped, awed face. 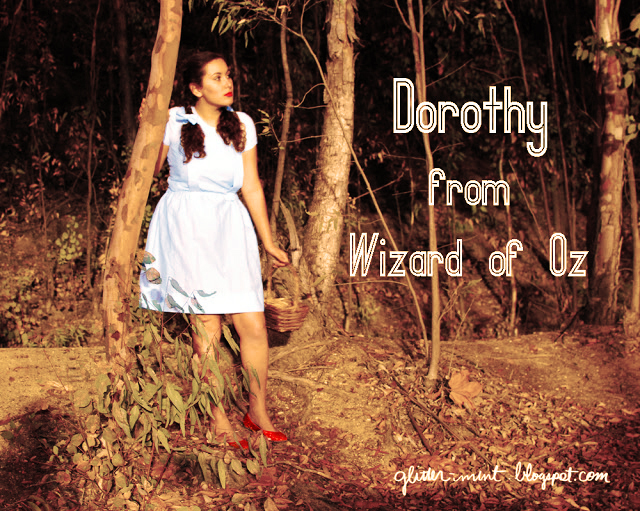 Check out our take on Dorothy below! 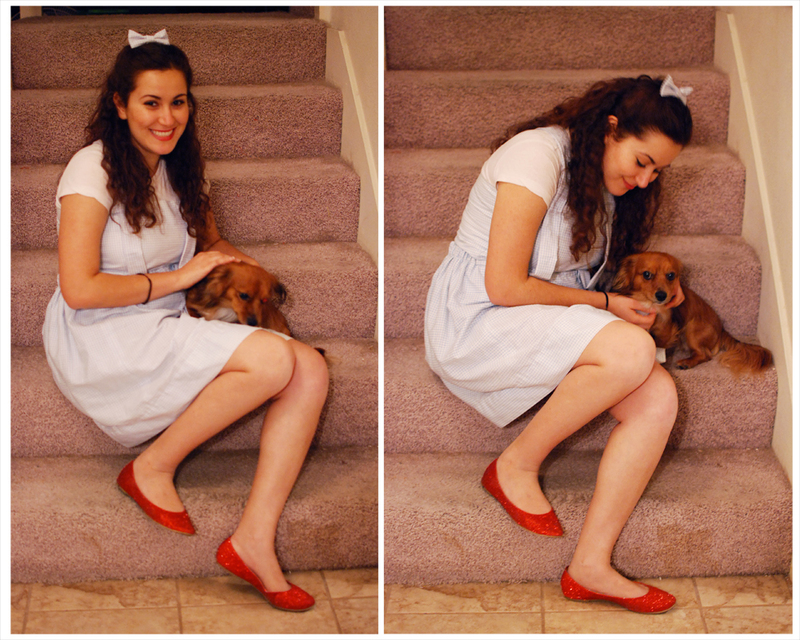 The two most important things you need for Dorothy are 1) a blue gingham or plaid dress and 2) sparkly ruby slippers! Everything else gets pulled together with the hair and a basket (a Toto helps too). Sandra's dress is actually a top and a skirt that we made from a thrifted dress. The skirt is a simple elastic waistband skirt. There's a good tutorial for it right here. 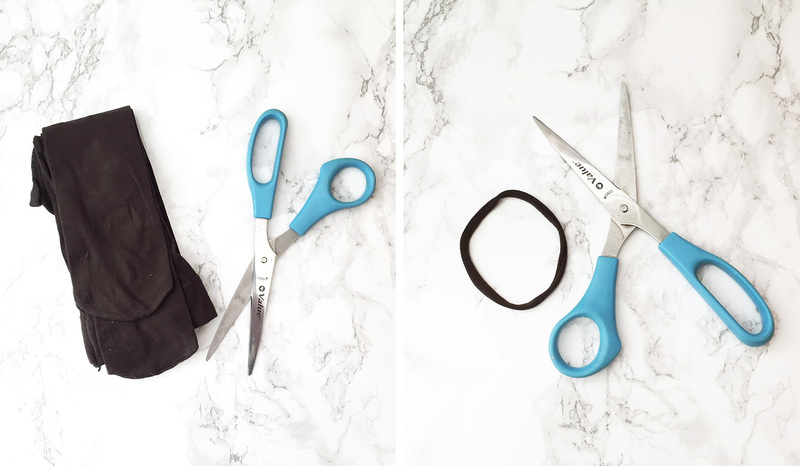 Basically you take a rectangle of fabric (or 2), fold over an inch on the long side, and sew so that you wind up with a tube on the edge. Then you thread your elastic through the tube and sew closed. The top is just another rectangle of fabric wrapped around Sandra's torso with some buttons on the back to close. The straps are sewn to the back of the bodice and 2 white buttons are sewn to the skirt. Didn't get any of that? 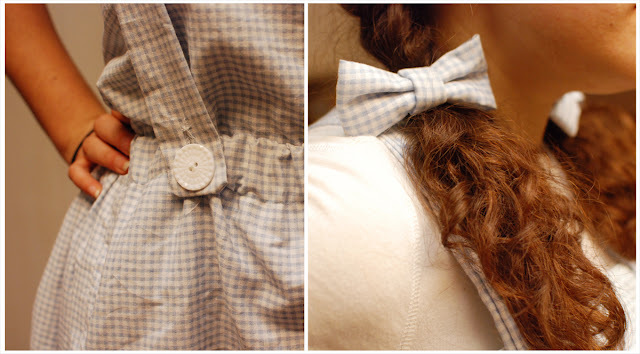 It's basically this tutorial but with a sewing machine instead of fabric glue. 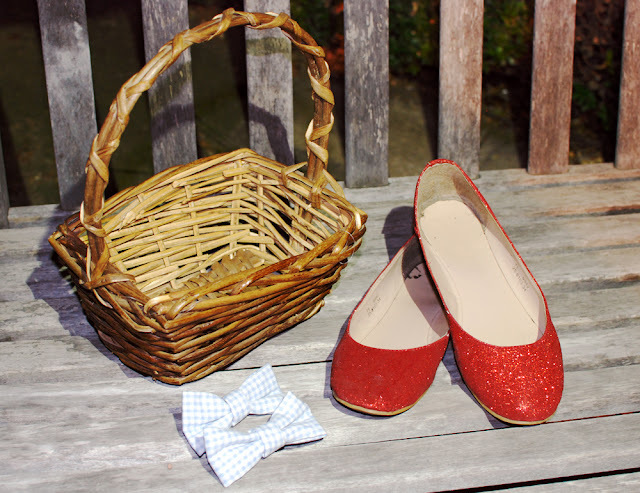 That tutorial also shows you how to glitter a pair of shoes, just in case you don't have sparkly red shoes lying around. We had some extra fabric so I made some simple bows. You could just tie some ribbons around your braids (since that's actually what Dorothy does) if you don't want to make bows. The other hair option! Fancy Dorothy! I forgot that Dorothy gets a makeover in Emerald City until Sandra reminded me. It's kind of a victory roll/half up, half down hair-do with a bow (or ribbon) slapped on top. A Beautiful Mess has a how-to on victory rolls here. And there you have Dorothy! I'll leave you with a recommendation to watch Tin Man, which I watched while making this outfit, and this Cracked article about Glinda the "Good" Witch. 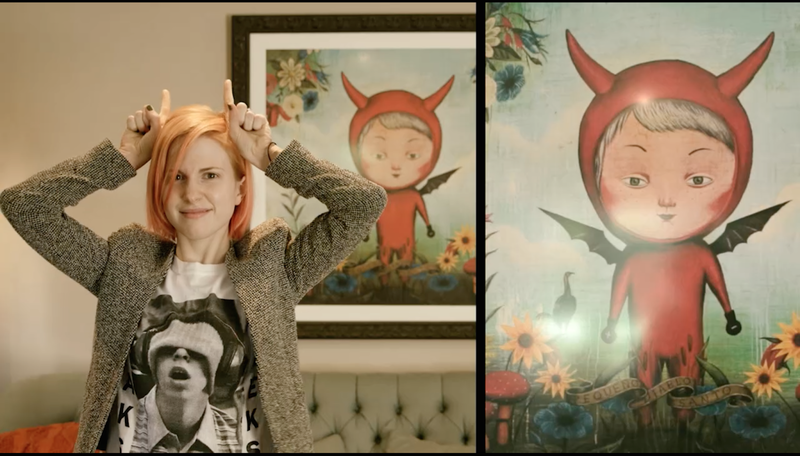 You'll never see her the same again.